Ducks - You say that like it's a bad thing. Nobody like to think about shots, but if we want our fuzzy feline friends (say that ten times fast) to live a long, healthy life, we have to keep track of their vaccinations. "Recommended Vaccinations for Adult Cats" can be a guide on where to start if you didn't get your cat as a kitten. A little bit more fun is "Common Instinctive Behavior in Dogs". Why do our dog buddies do some of the things they do? And what can we do about it, because, let's face it, some of those things are really annoying. Please check out the articles, and as usual, any comments or feedback are welcome! I just wanted to say ital_gal for donating to the It Gets Better campaign on LJ in my name, and giving me those cute little purple bears! They're so cute! Hee. How to Pet a Kitty. Also, 17 Things Worth Knowing About Your Cat -- and having nothing to do with cats, I didn't know that guinea pigs, squirrels, lemurs, elephants, and gorillas also purr? Cool! I mean, it's not that big of a deal -- I can watch whichever one I miss the next day, but MAN isn't SPN going to get whomped? Maybe not, and isn't season 5 the last anyway? I guess I'm just sad that my TV schedule is so damn EMPTY in the fall because so many of my favorite shows are opposite one another. I haven't done up the chart yet *cough*geek*cough*, so I can't get a good visual, but from what I can see, I'll be finding other things to do with my time than watch TV. Which... is actually a good thing, when I think about it. Disappointing procrastination activity is disappointing. (This whine does not apply to ontd_political, which can actually be fun. I found this in my random LJ wanderings today, and it brought tears to my eyes. 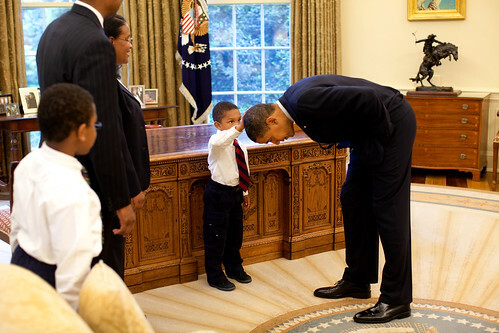 President Barack Obama bends over so the son of a White House staff member can pat his head during a family visit to the Oval Office May 8, 2009. The youngster wanted to see if the President's haircut felt like his own. I love my president. Not just as a symbol, but as a person. I've never felt that way about a president before, not even my beloved The Bill. I mean, I love The Bill, don't get me wrong, but I don't admire and respect him the way I do Obama. And that's even with some of the serious issues I have about some of the things going on in the administration right now. Ha! Also from my random wanderings, over at oberongeiger's place: - Saddest news of the upfronts: The CSI spinoff "NCIS" is now getting its own spinoff. Cop show spinoffs getting their own cop show spinoffs?! WTF, bro? Remember: Help control the cop show population, have your cop show spayed or neutered. Hey cat people -- how cool is THIS? That's MS Gaila to You!